Adherens junctions (or zonula adherens, intermediate junction, or "belt desmosome") are protein complexes that occur at cell–cell junctions in epithelial and endothelial tissues, usually more basal than tight junctions. 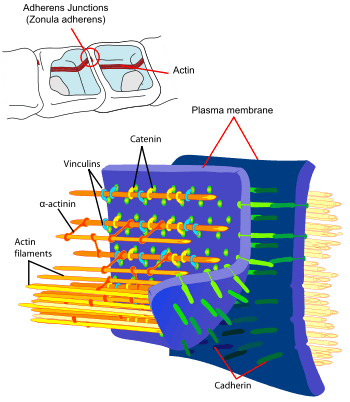 An adherens junction is defined as a cell junction whose cytoplasmic face is linked to the actin cytoskeleton. They can appear as bands encircling the cell (zonula adherens) or as spots of attachment to the extracellular matrix (adhesion plaques). ↑ Pardo, JV, Craig, SW (1979). "alpha-Actinin localization in the junctional complex of intestinal epithelial cells". J Cell Biol. 80: 203–210. doi:10.1083/jcb.80.1.203. Retrieved 15 October 2014. ↑ Guo, Renyong; Sakamoto, Hiroshi; Sugiura, Shigeki (October 2006). "Endothelial Cell Motility Is Compatible With Junctional Integrity". Journal of Cellular Physiology. 211: 327–335. doi:10.1002/jcp.20937. ↑ Ferreri DM, Vincent PA (2008). "Signaling to and through the Endothelial Adherens Junction". In LaFlamme SE, Kowalczyck AP. Cell Junctions: Adhesion, Development, and Disease. Wiley VCH. ISBN 978-3-527-31882-7. ↑ Yamada S, Pokutta S, Drees F, Weis W, Nelson W (2005). "Deconstructing the cadherin-catenin-actin complex.". Cell. 123 (5): 889–901. doi:10.1016/j.cell.2005.09.020. PMC 3368712 . PMID 16325582. ↑ Drees F, Pokutta S, Yamada S, Nelson W, Weis W (2005). "Alpha-catenin is a molecular switch that binds E-cadherin-beta-catenin and regulates actin-filament assembly.". Cell. 123 (5): 903–15. doi:10.1016/j.cell.2005.09.021. PMC 3369825 . PMID 16325583.